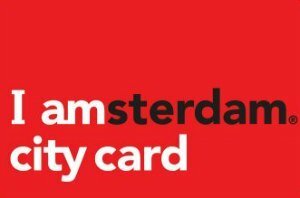 Here are some of the best bars in Amsterdam, with the best atmosphere to relax in, and the best Dutch beer! Review: Located in a former distillery, In de Wildeman is an Amsterdam bar with a very unique and funky character. This beer tasting bar is different because there is no music. However, it does offer a great list of beers. The beer selection is focused mainly on Belgian and Dutch beers. It has over 250 types of bottled beers, American beers, bottled ciders and 18 draft beers. The bar also offers English ale, draft and bottled German beer, British beer and much more. In de Wildeman sources its beers from trappist breweries and local Dutch brewers to provide patrons a taste of the local breweries. It is visited by locals as well as people from around the world. Review: With over 170 breweries strewn around in Netherlands, Proeflokaal Arendsnest is definitely a great Amsterdam bar if you want to taste local Dutch brews. This tasting room only serves beer from local Dutch breweries and it does have plenty of choices available. There are 30 beers available on tap and over 100 bottled beers to choose from. Other than beer, Proeflokaal Arendsnest also has several other local drinks to try. There are over 15 liqueurs, 40 types of gins, 3 ciders, over 5 single malt whiskeys and even organic juices and soft drinks to choose from. Try the Dutch sausages and cheeses they serve up along with your favorite drink. 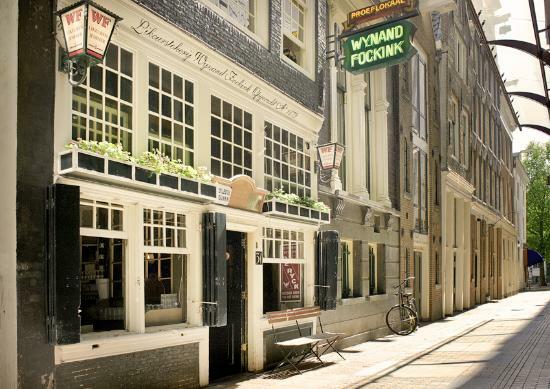 Review: Wynand Fockink dates back to 1679 and is still as charming and full of character as it was back in the day. This distillery includes a liquor shop and a tasting room featuring an impressive range of gin or jenever based drinks to choose from. 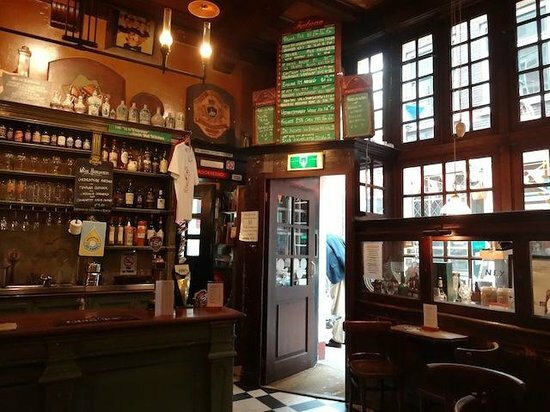 For over 3 centuries, this tasting room has been offering a selection of locally brewed Dutch jenevers and liqueurs that are made on the premises. The selection includes world famous Dutch Liqueurs such as Boswandeling, Half en Half, Hansie in de kelder and Bruidstranen. WF Superior is a 3 year old malt jenever that is worth trying at this cool Amsterdam bar. Review: Amsterdam bar Brouwerij't IJ offers a large collection of impressive beer, served directly from the tanks. All the beers served at the bar are still brewed the traditional way without pasteurization or filtering. They therefore have a full, fine flavor and a very unique taste. The bar itself has a lot of character. It has the largest collection of beer bottles in the world. The beer served up at the bar includes Zatte, the first ever beer to be made at the brewery. It is a strong, blonde beer with a fruity scent and a dry aftertaste. 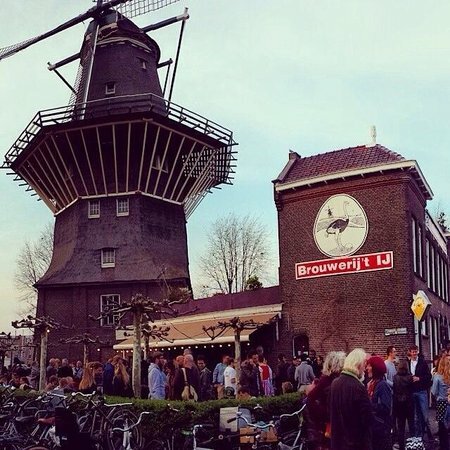 Brouwerij't IJ also serves up several excellent limited edition and seasonal beers. 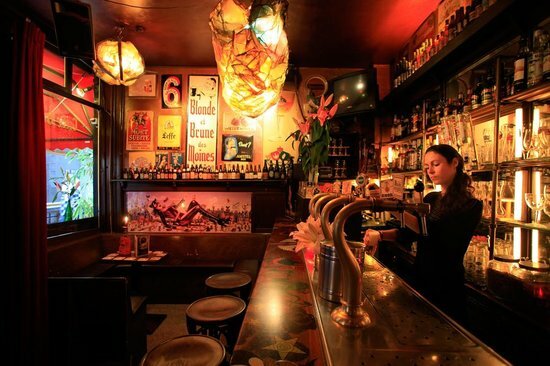 Review: Known as the best Brown Bar in Amsterdam, The Pilsener Club is a cozy spot tucked away from the busy shopping streets. It is a popular spot for the locals as well as the tourists. The atmosphere is quite laid back and fun and the beer selection offered is equally impressive. If you're not sure what to order, the staff members are always on hand to guide you through the selection and recommend a beer that you might like. The Pilsener Club offers a selection of local beers that you might want to try. It also serves up a selection of snacks to enjoy with your beers. 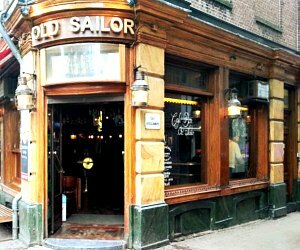 Review: Located right in the notorious Red Light District, the Old Sailor Pub might be a small Amsterdam bar but it is usually packed with people regardless of the time you visit. If you love people watching, buzzing atmosphere, good service and good beer, this is a great place to visit. Inside, the bar features model sailing vessels, maritime décor, nautical lamps and eye-catching items everywhere. The bar has a decent selection of beers and is incredibly popular with tourists as well as the locals because the drinks here are much more affordable compared to most other bars in Amsterdam's Red Light District. Review: If you love Belgium beers, Café Belgique is worth visiting. 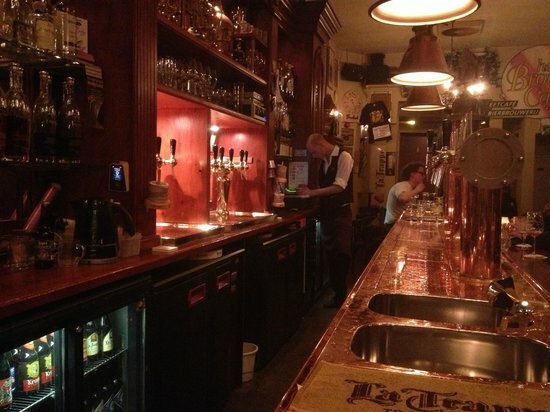 This cozy little Amsterdam bar specializes in serving up fine quality Belgium beers. While it is one of the city's smallest pubs, you will find more than 50 bottled beers and 8 beers on tap. 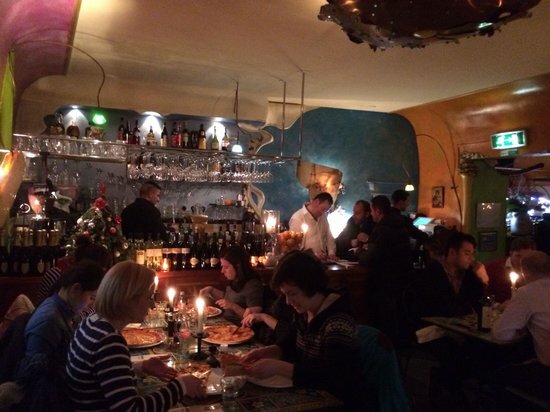 It is visited by artists, musicians, expats, tourists and locals because of it's somewhat cult status. With its quirky décor, friendly staff members and its incredible variety of Belgium beers, it is definitely quite popular. It might be difficult to get a spot inside the bar but if you appreciate fine beer, it is definitely worth the wait. 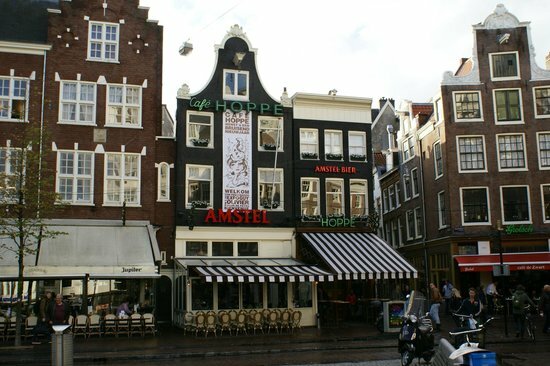 Review: Café Hoppe is a fine Amsterdam bar that has been in operation since 1670. It prides itself on maintaining premium quality in everything it serves, from excellent quality tap beer to bitterbal. If you love beer, Café Hoppe has a fine selection of bottled as well as tap beers. You'll find several unique specialties on the menu like vaasje and fluitje. For a taste of true Dutch drinks, try some of the liqueurs and jenevers served up at the bar. Café Hoppe also has a wide var4eity of fragrant white, full bodied red and even award winning house wines to choose from. 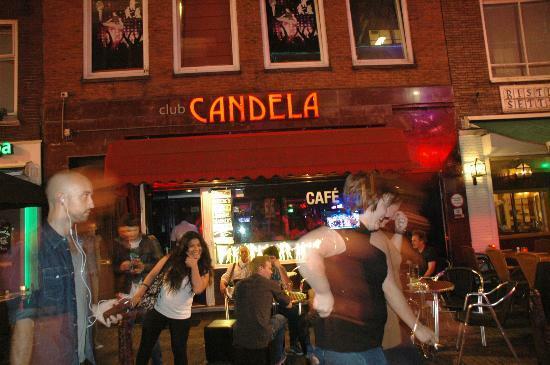 Review: Club Candela is a great Amsterdam bar located in the heart of Leidseplein and offers everything you'd want from a hip night spot. With a welcoming staff, lovely bar and a great selection of cocktails and beer, this bar is definitely a very chilled out spot to visit. Club Candela stands out from the other bars in the area because of its incredibly low prices. With live music, karaoke, open mic nights, smoking rooms and large screen televisions for games, the bar is always lively and there's always good entertainment available. The drinks are just as impressive with a good balance of variety and affordability. Review: Door 74 is Netherland's first every speakeasy style luxury cocktail bar. With its hidden door, it is definitely hard to find but once you settle down inside and get a taste of one of their fine quality cocktails, you'll understand that it's worth the effort. With is suave, sophisticated atmosphere, attentive staff members and its antique décor, Door 74 is an indulgent experience. The cocktail menu at this Amsterdam bar is unique and creative and features drinks like the Moscow Mule, Tessmanian Devil, Fox Hole Frenchy and more. Additionally, the menu also features seasonal long drinks, barrel aged cocktails and a selection of champagnes, beers and wines.